• For the first time, followers of fashion from across the globe can watch fashion shows from the biggest names either live or on demand, and buy their favourite items of clothing directly from the interactive videos - seven months before they are available in stores. • On "Watch, Click and Buy" at the moment we have shows from Vivienne Westwood, Thierry Mugler, Vera Wang, Marios Schwab and Maxime Simoens, Guy Laroche, Zac Posen and more. Paris, March 18, 2013, 7:20 am -- /EPR NETWORK/ -- MyBeautifulDressing today announced the launch of a new way of buying designer clothing online. 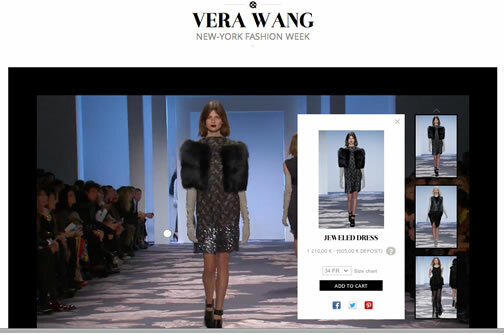 While most websites only offer the equivalent of paper brochures transferred to the web, you can now choose items of clothing and shop for them directly using interactive videos - either live or after fashion shows. The first e-commerce website to offer this technology, MyBD enables you to watch a fashion show just for you, giving you the possibility of experiencing something truly unique and immersive, browsing around the fashion show (you can focus on a particular model, have them re-show the clothes on the catwalk when you want, and place orders without having to wait for the official unveiling of the clothes in stores seven months later). For this launch, MyBeautifulDressing is working with JC de Castelbajac and broadcast the Foxy Lady collection fashion show live on its website on 5 March - a collection available for pre-orders the following day on the website. MyBD has already negotiated a number of other collaborations for live shows and pre-orders following shows with major names for the upcoming Fashion Week. Most of these collections will be available for pre-ordering on the website from 20 March 2013. During Fashion Week, MyBD is working alongside international blogger Chiara Ferragni, The Blonde Salad in a video showing off her MyBeautifulDressing experience: "Shop like you were there!" MyBeautifulDressing.com is the leading French luxury website enabling followers of fashion in France and across the world to sit in the front row without leaving the comfort of their own homes. Like a professional buyer or fashion writer, they can order clothes as soon as the catwalk show is over, to be delivered before they come out in stores. Top current designers such as Thierry Mugler, Maxime Simoens, Zac Posen, Richard Nicoll and more are working together with MyBeautifulDressing to offer clothing, accessories and jewellery immediately after their fashion show unveiling. MyBeautifulDressing is the brainchild of its founders, Celine Brugnon and Sandra Mascio, both passionate about fashion, with a desire to offer clothes designers a new way of showing off their creations to the public once the models have left the catwalk.